Accounting is known as the “language of business”. Accounting is a means through which information about your business entity is communicated through financial statements, the end-product reports. Therefore, the purpose of accounting is to provide information to different users for making economic decisions. QuickBooks is a great resource for all your accounting needs. Every small business owner should have at least some understanding of daily record-keeping practices and principles. Even if you hire an accountant to manage your books, you need to have a basic knowledge of how things work to ensure they’re being processed correctly. Here are some of the basic accounting and bookkeeping principles defined in simple terms. Accounts payable (AP) is money owed by a business to its suppliers shown as a liability on a company’s balance sheet. Accounts receivable (AR) refers to the outstanding invoices a company has or the money the company is owed from its clients. The phrase refers to accounts a business has a right to receive because it has delivered a product or service. Journal entries (JE) are the methods used to enter an accounting transaction into the accounting records of a business. The accounting records are combined into the general ledger, or the journal entries may be recorded in a variety of sub-ledgers, which are later rolled up into the general ledger. Amortization is an accounting term that refers to the process of allocating the cost of an intangible asset over a period of time. It also refers to the repayment of loan principal over time. Assets are property owned by a person or company, regarded as having value and available to meet debts, commitments, or legacies. The single- and double-entry bookkeeping methods are the ones most commonly used within small businesses. Your personal checkbook uses the single-entry method, with debits and credits recorded as your balance increases and decreases. It tells you how much money you have in the bank, but it doesn’t account for where your money’s going in the future. The double-entry method, on the other hand, records your expenses and accounts in the appropriate categories. It tells you how much you’re spending on a particular expense category and tracks future spending. The double-entry bookkeeping method is the most common strategy used by accounting software, large corporations and CPAs. A balance sheet is a financial statement that summarizes a company’s assets, liabilities and shareholders’ equity at a specific point in time. These three balance sheet segments give investors an idea as to what the company owns and owes, as well as the amount invested by shareholders. The cash you have in your accounts plus all of your assets and investments are known in business finance terms as capital. The two major types of capital are debt and equity. Debt involves borrowed funds that are expected to be repaid from loans or other financing options. Equity relates to selling off interest in the company in exchange for money, and it is viewed as an investment in the business. Cash flow represents both money coming in and going out of your business accounts. There are different types of cash flow, including operational, investment and financing. Without a good amount of cash flow, your business will fail. Debits are entries recording an amount owed, listed on the left-hand side or column of an account. Credits are entries recording a sum received, listed on the right-hand side or column of an account. Depreciation is a reduction in the value of an asset with the passage of time, due to wear and tear. The formula for depreciation considers the useful life of the product, the salvage value and purchase price (or cost basis). The difference between depreciation and amortization is that depreciation relates to tangible assets, whereas amortization pertains to intangible assets. A liability is anything that relates to a debt or financial obligation. It is recorded on your company’s balance sheet. This includes accounts payable, income taxes, wages and other accounts owed. 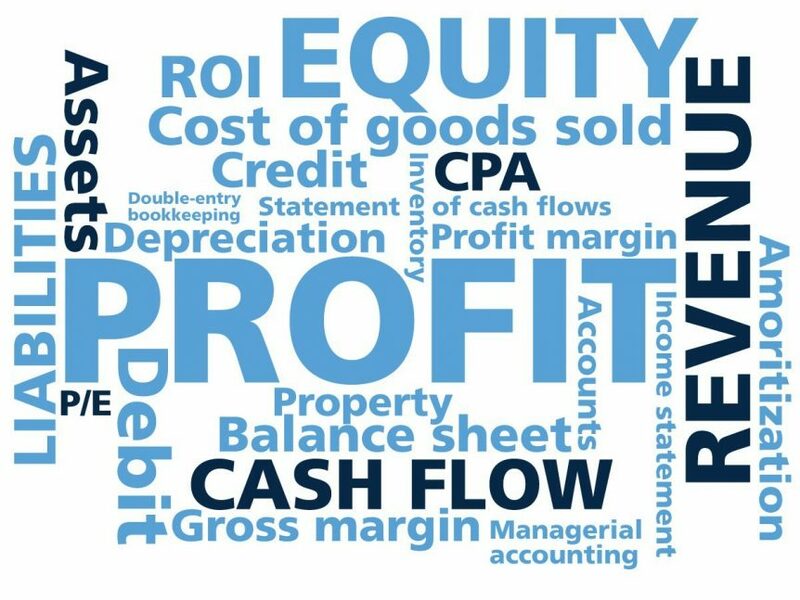 An income statement, also known as a profit and loss statement, summarizes the business income, expenses and total cost during a specific period. It shows the profit that the business earned during this time as well as the loss incurred, and it gives a positive or negative figure. Understanding the basic vocabulary and principles of accounting will help you manage your books. Combine this knowledge with QuickBooks accounting software and your finances should be well taken care of. If you have questions, please contact me. QuickBooks Online ….. Did You Know?